God is holy. It is an undisputed view among non atheists and non agnostics. Yes that is unusual classification but it is logical. So the holy God could be represented on earth by his relatives like descendants or by servants like his mailman/courier or through people in telepathic communication with him. Then there are holy people who represent God on earth and these people tell others what to do or what not to do. So far holiness is intact in the chain of command. All become holy like catching an infection. No problem. The problem is that the God-fearing or following people at the bottom of ladder, are not treated as holy. Why? After all if others on same ladder are holy, why exclude the people at bottom? Why they are not infected. This is illogical. If there is any logic I would like to know rather understand it. Will somebody do the honours? Similar is the position of objects touched or used by holiness. 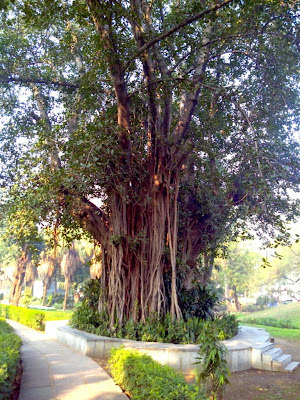 Many Banyan Trees are treated as holy. But this tree in picture has same grievance i.e. it is not being treated as holy. I have assured it that I will convey the answer as soon as I get it. This entry was posted in Humour, Philosophy & Religion and tagged God, God 's representatives, holiness, Holy, Mailman, Messenger. Bookmark the permalink.